A motorcyclist on a Yamaha R1 is lucky to be alive after hitting the guard rail and sailing over the edge near San Francisco recently. 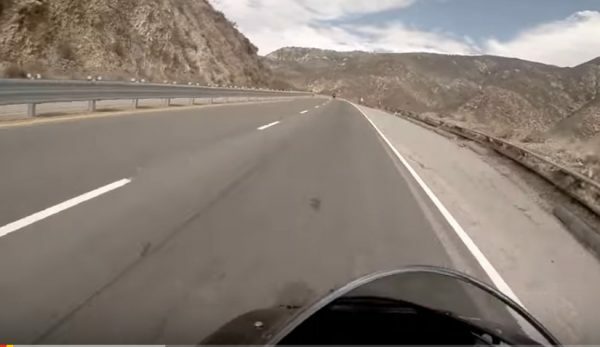 Thanks to the proliferation of GoPro cameras, we have a record of the whole thing, which serves as a warning to any riders who may forget how quickly it can all go south out there. Riding a bike means harnessing a bundle of kinetic energy that can come out in some very sudden and potentially deadly ways. Even the best protective gear doesn’t guarantee safety in the event of a crash. In this instance, the rider — identified only as FreakinRiley — is rolling along just fine with his friend out front when out of nowhere he slides into the right side guard rail and tumbles over the edge, coming to rest in the weeds. His bike continues on for maybe 60 yards. And the GoPro continues to record the rider’s painful muttering as he lays on the ground, coming to grips with the fact he just crashed, and not yet knowing how bad it is. In the end, he suffered a serial fracture to his leg, five broken ribs and a collapsed lung.